I'm usually disappointed when I learn that a favorite book or story is being made into a movie. Even though I often enjoy film versions of great tales, I assume that what I love about a book will be lost in adaptation. When I heard that Yann Martel's Man Booker Prize–winning Life of Pi was being adapted into a film, I didn't think anyone could bring such a beautiful book to the screen without abandoning what made it beautiful. What a shame, I thought, not every good book makes an equally good movie. Reading is a private experience. A stranger's words combine with our imagination to create images and perceptions that exist solely in our heads. Sure, we talk about the books we read with friends, and our reactions to them are often similar—but the way a story looks and sounds in our mind is individual. Each of us hears the cadence of a character's voice, sees the shifts of emotion on characters' faces, and senses the atmosphere of a described location in different ways. When a book is brought to the screen, not only is there the chance that what we see will be far different than what we envisioned and felt reading the book, there's also the risk that the movie will provide so much less of everything compared to our reading that we will lose some of what the text gave us. It's similar to reconnecting with a friend from childhood as an adult. If we like the person, it's wonderful, and we're delighted to see them again. But if the grown-up version of our friend disappoints us, our fond childhood memories are now tainted by the reality of an adult we can't wait to escape. With this risk in mind I saw Life of Pi. If you're unfamiliar with the book here's a simple synopsis: It's about an inquisitive Indian boy, Piscine (Pi) Patel, whose father decides to sell the family's small zoo and move the family and animals to Canada. After a storm sinks their ship, Pi is left sharing a lifeboat with a Bengal tiger named Richard Parker. There's much more to it, as Life of Pi is a story of stories within stories, but I won't go into the layers of the book. In the end the reader is left wondering which stories to believe and why he or she might want to believe them. Given that most of the book chronicles the 227 days that Pi has no one to talk to but a tiger, and that it contains more reflection than action, I assumed the work was unfilmable. But thanks to the incredible talents of director Ang Lee and screenwriter David Magee, I was wrong. The movie is gorgeous, epic, and as captivating as the novel. Lee's a sensuous storyteller (he also directed the lush Crouching Tiger, Hidden Dragon, Brokeback Mountain, and Sense and Sensibility) and the vast setting of a seemingly endless ocean and sky allows him to adopt a wide range of sweeping, magnificent views. In all of them sit Pi and Richard Parker, two small, powerful forces of nature at the mercy of larger forces. Both boy and animal must adapt quickly to their confining circumstances to survive. Using CGI and a rotation of real tigers, Lee brings Richard Parker to glorious, believable life without Hollywood overkill. Life of Pi is not a Disney-like story and, thankfully, the film isn't Disney-like either. Animals aren't portrayed with human qualities, and the human connection to animals and nature isn't sentimentalized or depicted as if humans can control either. Lee also uses 3D to extraordinary effect; he doesn't employ it to surprise the audience, but only to enhance the depth and color of the glorious natural world. Screenwriter David Magee is equally responsible for the film's success. Magee and Lee worked on the script for over three and a half years, writing 170 drafts. Each received an Oscar nomination for his work on the film, a confirmation that their dedication to the material was worth it. Life of Pi is the type of film adaptation all readers hope for—it enhances the experience of reading the book and creates an even greater appreciation of the author's work. I couldn't stop talking about and reflecting on the book when I read it in 2001, and seeing the movie years later brought me back to the same place with equal intensity. While I marveled at Martel's stunning, descriptive writing and his creativity in weaving stories together as I read the book, seeing Lee's eloquent interpretation onscreen somehow magnified my impression of Martel's talent. And last week I experienced the best possible outcome of a book-to-film adaptation—a young friend who saw the movie, but hadn't read the book, asked to borrow my copy of Life of Pi. I look forward to talking about the book, yet again, with her soon. Sharon Crowley works in K–12 marketing at the Great Books Foundation. 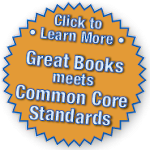 Great Books webinars give you what you need to know now. From learning new instructional strategies to improving your skills leading Shared Inquiry™ discussions, our 90-minute interactive webinars make it easy to gain insights and collaborate with colleagues across the country. Need another date? Click here.